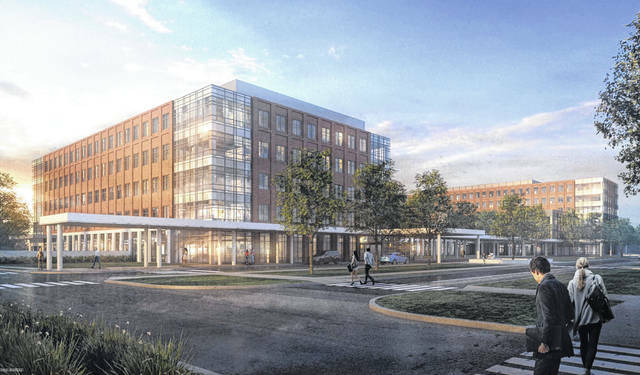 Pictured is a rendering of The Ohio State University Wexner Medical Center’s proposed ambulatory care facility that would be located on Sawmill Parkway, directly across for Olentangy Liberty High School. This rendering shows the layout for phase I and phase II of The Ohio State University Wexner Medical Center’s proposed facility, which is currently awaiting final development plan approval from Powell City Council. The hospital, visible in the northwest corner of the property, would be built as part of phase II. Powell City Council held a special meeting Tuesday (Jan. 29) to present the first reading of the final development plan for The Ohio State University Wexner Medical Center facility proposed for construction on the northeast corner of Sawmill Parkway and Home Road, across from Olentangy Liberty High School. The plan, along with the annexation of the land into Powell, is expected to be approved during next week’s regularly scheduled council meeting. 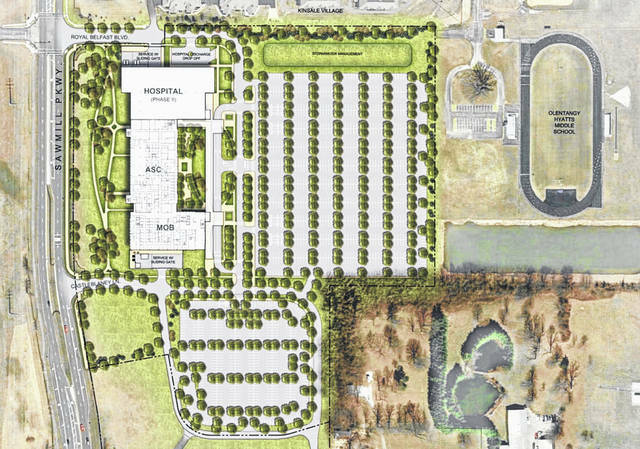 The first phase of the development would include an ambulatory care center and medical office building totaling approximately 200,000 square feet. The ambulatory care center would feature outpatient services, including surgeries, lab testing, physician visits and more. The facility would include a large setback from Sawmill Parkway, with 2.74 acres of green space and walking paths between the building and road. To the east, or rear of the ambulatory care facility, would be a cafe courtyard and respite garden, as well as the entry court. City staff expects OSU to initiate the first phase within two years of its approval and completion of the project within five years. As part of the necessary traffic improvements, traffic lights would be added at Tullamore Drive and Home Road, as well as at Castleblaney Lane and Sawmill Parkway. Left turn lanes would also be added at those intersections. “This represents the largest single economic development project in the city’s history,” City Manager Steve Lutz said during the meeting. The process of getting the final development plan in front of city council for approval has been lengthy. OSU submitted a sketch plan review to the Powell Planning and Zoning Commission on July 11 to initiate the process, and they have since met several more times as details and delays have developed. Last week, OSU was granted approval for the final development plan by planning and zoning officials despite some design details that are still ongoing. Commission members said there is reasonable comfort in moving forward with a final development plan that is still missing details because of the OSU name that will be constructing the building. Underhill estimated the final design was around 80 percent finished, and there is an understanding that OSU will come before city staff with all remaining details. Final, completed designs for the medical center aren’t expected to be available for 6-8 months. Asked why the annexation wasn’t better timed to match the timeframe of the design plans, Underhill pointed to various factors and such a project being a fairly new endeavor for the university. Councilman Daniel Swartwout expressed great appreciation for how the partnership between the city and OSU has developed, and the optimism it gives him about the relationship moving forward. The next council meeting was held at 7:30 p.m. on Tuesday, Feb. 5. Meetings are held in the city council chambers, located at 47 Hall St.